What is the National School Breakfast Program? The School Breakfast Program is a federally assisted meal program operating in public and nonprofit private schools and residential child care institutions. It began as a pilot project in 1966, and was made permanent in 1975. The School Breakfast Program is administered at the Federal level by the Food and Nutrition Service. At the State level, the program is usually administered by State education agencies, which operate the program through agreements with local school food authorities in more than 89,000 schools and institutions. The National School Lunch Program is a federally assisted meal program operating in over 100,000 public and non-profit private schools and residential child care institutions. It provided nutritionally balanced, low-cost or free lunches to more than 31 million children each school day in 2011. In 1998, Congress expanded the National School Lunch Program to include reimbursement for snacks served to children in afterschool educational and enrichment programs to include children through 18 years of age. The Food and Nutrition Service administers the program at the Federal level. At the State level, the National School Lunch Program is usually administered by State education agencies, which operate the program through agreements with school food authorities. What are the nutritional requirements for school lunches? The Healthy, Hunger-Free Kids Act of 2010 directed USDA to update the NSLP’s meal pattern and nutrition standards based on the latest Dietary Guidelines for Americans. The new meal pattern went into effect at the beginning of SY 2012-13, and increased the availability of fruits, vegetables, and whole grains in the school menu. 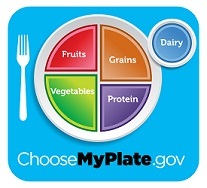 New dietary specifications set specific calorie limits to ensure age-appropriate meals for grades K-5, 6-8, and 9-12. Other meal enhancements include gradual reductions in the sodium content of the meals (sodium targets must be reached by SY 2014-15, SY 2017-18 and SY 2022-23). While school lunches must meet federal meal requirements, decisions about what specific foods to serve and how they are prepared are made by local school food authorities. Presentation from PTO Breakfast Initiative Meeting August 14 2018.